Published: June 17, 2014 at 09:57 a.m. Updated: June 18, 2014 at 12:20 p.m. The NBA's biggest star has said more than once that he would have attended Ohio State had he not made the leap from high school directly to the NBA. Urban Meyer has had James speak to the team, and he's shown up on the Buckeyes sideline at times as well. 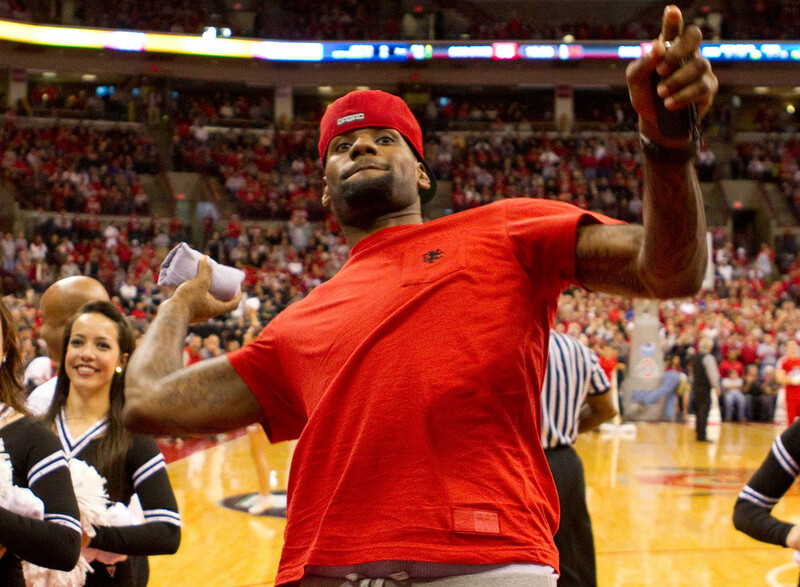 There's no doubting he's a fan, although for a guy who never attended the school, Ohio State tends to go overboard in efforts to associate itself with King James. A friendship with former UM coach Lloyd Carr made a Wolverine of the Academy Award-winning actor. Crowe spoke to the Wolverines, 0-2 at the time, prior to a 38-0 win over Notre Dame in 2007, which was followed by a joint post-game news conference with Carr. Nobody can say Vaughn is a bandwagon fan of the Fighting Irish. He’s been a Notre Dame supporter since he was a kid, growing up in suburban Chicago. Naturally, he had a role in “Rudy,” the acclaimed film about Notre Dame walk-on football player Rudy Ruettiger. The retiring king of late-night comedy is no sidewalk alum. He attended Ball State, has a building named after him there, a scholarship in his name, and has even installed a lecture series that brings prominent speakers to the BSU campus. He’s not only a fan; he’s this school’s lead ambassador. The movie star and former SNL comic is Southern Cal through and through, and an alum of the school. He's performed with the Marching Trojans band, crashed Pete Carroll speeches, and delivered a fairly spot-on impersonation of former USC interim coach Ed Orgeron. The country music star was born in Knoxville, and although he didn't attend UT, he's a longtime Volunteers fan. Chesney even penned a song in tribute to former Volunteers radio voice John Ward. He also produced a documentary film about the first African-American starting quarterback in SEC history, Condredge Holloway, who broke that barrier at Tennessee. If you're a lucky-enough Florida Gators fan, you've spotted The Nature Boy at Florida Field -- and not up in some high-brow suite, but down among the masses under the hot Florida sun (he's also had some sideline access, but the former pro wrestling icon is a champion of the people). And for anyone unsure where Flair's allegiance lies, he's been known to show off his Florida Gators boxer shorts. Born in Cedar Rapids, Iowa, Kutcher is lifelong Hawkeyes fan and attended UI. A few years ago, Iowa drew some heat from the NCAA when Kutcher and then-wife star actress Demi Moore were permitted to meet a couple of Hawkeyes basketball recruits while attending a football game. The school was only charged with a secondary (minor) rules violation. You know a celebrity is indelibly tied to a college sports team when a Q&A with that celebrity surfaces on the school's official web site. Such is the embrace between the down-home comedian and his Nebraska Cornhuskers. The Nebraska native has even been a guest coach on the sideline. Only in America. Born and raised in Texas, the actor graduated from UT and is its most popular fan. He has an annual charity fundraiser in which he partners with former Texas coach Mack Brown. This spoof previewing Texas' 2005 Rose Bowl national title tilt against Southern Cal with Will Ferrell says it all. McConaughey, by the way, was on the Texas sideline for that one. A longtime Southern Cal fan, the famous rapper has been a sideline fixture on Saturdays for home games. And it doesn't hurt that USC is also in pursuit of his son, who is a top wide receiver prospect and holds a scholarship offer from the school, among many others. But despite his allegiance, rival UCLA is making its pitch to both Snoop and son. The actor's fondness for the Crimson Tide drew a lot of attention when he was asked about his college football preference in a video interview with GQ Magazine. As a native of Cullman, Ala., it's not altogether surprising that he landed on the Alabama side of the fence that demands allegiance to UA or Auburn of all state residents. Other famous Tide fans: Courteney Cox, Sela Ward and Joe Scarborough. It’s been a long time since Woods was a dominant NCAA golfer at Stanford, but he’s never been away too long to show his colors. He’s tossed a coin to start a Cal-Stanford football game, and was an honorary team captain for the 2012 Fiesta Bowl against Arizona. Woods also once shared a Stanford classroom with Cardinal coach David Shaw.